An interesting relationship has come to light between the closing price of Bitcoin (on the MtGox USD exchange) and the level of interest in Bitcoin as measured by Google Insights for search. The above data was taken for the last 90 days. The faint blue line represents the search interest in the term "bitcoin" and the dark black line represents the closing price of Bitcoin on the MtGox USD exchange. As the Bitcoin wiki itself states, yes, Bitcoin is a bubble, but only insofar that the US Dollar and Japanese Yen are also bubbles, i.e. they only have value in exchange and no value in use by themselves. If a loss of confidence occurred in any currency, its value could drop dramatically overnight. 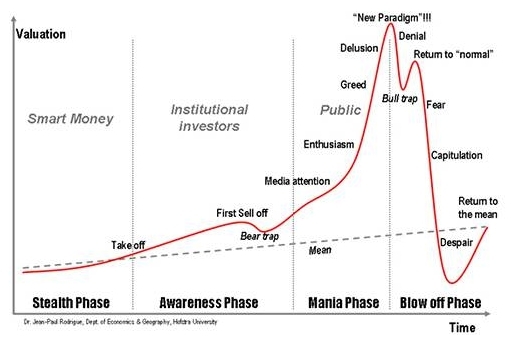 The definition of a Speculative Bubble on wikipedia lists a number of possible causes, not least of which are those related to crowd psychology, such as the greater fool theory, which identifies bubbles as being driven by the behavior of irrationally exuberant market participants (the fools) who buy overvalued assets in anticipation of selling them to other speculators (the greater fools) at a much higher price. Another related explanation lies with herd behavior, the observation that speculators tend to buy or sell in the direction of the market trend. This is sometimes pushed along further by market analysts, who try precisely to detect those trends and follow them, which creates a self-fulfilling prophecy. A well known side effect of a bubble is that market participants with overvalued assets will tend to spend more because they "feel" richer, due to the wealth effect. In history, bubbles have been observed repeatedly in experimental markets, wherever there is some degree of uncertainty, and when market participants find it difficult or impossible to calculate the intrinsic value of the assets. Now lets compare the bubble chart above with the actual year to date (up to Aug-11-2011) closing prices of Bitcoin on the MtGox exchange. Yeah, its looking more like a bubble every day, even if the scale doesn't quite match those of the classic bubble phases.